Goal of XI is to provide a single point of integration for all systems, SAP and non- SAP, inside and outside a corporate boundary. The XI supports B2B as well as A2A exchanges, supports synchronous and asynchronous message exchange, and includes a built-in engine for designing and executing integration processes. 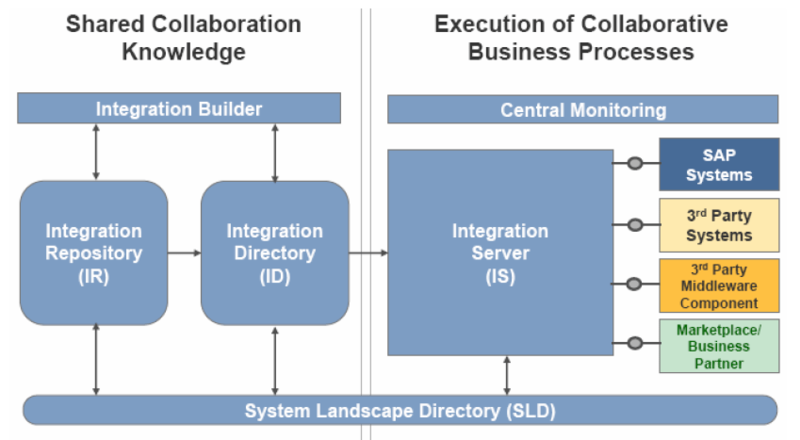 Today, many components in customer system landscapes are directly connect 1:1 and above sort of spider web is the view of today’s application integration challenge. Connecting these applications does not only lead to high complexity in managing and maintaining but there is also a lot of cost associated with it. Hence, the overall concept of SAP XI is to drive integrated business processes across heterogeneous and highly dynamic IT landscapes in a more manageable and cost effective way. The basic idea is to provide a run time infrastructure which allows heterogeneous systems to be tied together with fewer connections and at the same time, in order to connect those applications and let message flow from one application to the other, have a centralized storage of the integration knowledge. SAP XI / PI is open and flexible, it uses web standards such as Web Service Description Language (WSDL), XML Schema Definition Language (XSD), and SOAP messaging for describing objects and communicating with other systems. The architecture includes components to be used at design time, components to be used at configuration time, and components to be used at run time. The System Landscape Directory: a central repository of information about software and systems in the data center. The Integration Repository: For the design and development of Interface, Process, and Mapping objects that are used to implement Integration Scenarios. The Integration Directory: For configuring scenarios from the Integration Repository in the concrete customer landscape. The Integration Server: The central processing engine of the XI. All messages, whether SAP or non-SAP, A2A or B2B, regardless of backend technology or vendor, are processed in a consistent way. 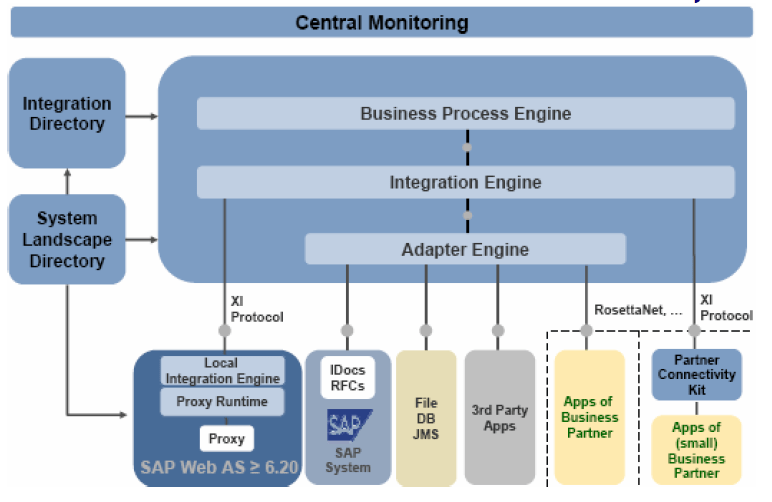 Central Monitoring: To give a comprehensive and focused view of all components and processes at runtime. The Adapter Engine: A Java Connector Architecture (JCA) compliant adapter engine for connecting backend systems to the XI. At run time, the integration scenarios that have been developed in the integration repository and configured in integration directory are executed by the integration server. The integration server includes engines for executing integration processes (business processes), processing messages and connecting to back end systems. 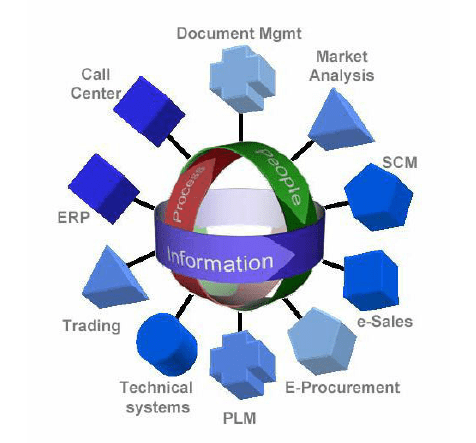 Communication between mySAP systems based on the SAP Web AS version 6.40 or higher communicate natively with the XI, other systems, including those using B2B standards such as RossettaNet, CIDX, and PIDX, communicate via adapters. SAP also provides the Partner Connectivity Kit (PCK) which allows smaller partners and subsidiaries that may not have XML messaging or B2B capabilities to communicate natively with XI across firewalls and across the internet. SAP HANA Tutorial – SAP HANA Training: What is SAP HANA ? Good architecture and nice analysis for adminstration..